Welcome to the Crosby Scholars Senior Program! High school juniors who complete the requirements of the Junior Program, including attending a Mandatory Think Like A Senior Session, are eligible to become senior Crosby Scholars. Scholars begin the Senior Program by meeting individually with a staff summer counselor at a Mandatory Senior Meeting during the summer prior to their senior year. A slide detailing this meeting is included in the powerpoint presentation from the Think Like A Senior Session, and a description is included on the list of senior program requirements posted in the Crosby Scholars Student Portal. Scholars who do not attend this meeting are dismissed from the Program. As active participants in the Senior Program, scholars must comply with the Partnership Agreement and complete the Senior Program requirements. Scholars who complete the Senior Program receive a special designation on their transcript and in their graduation program. They are honored at the Senior Gala in the spring and given the opportunity to apply for Last Dollar Grant funding. Click here to view Frequently Asked Questions about Selecting a Senior Advisor. Research the NCAA requirements for students wishing to play DI or DII collegiate sports. For additional information on academies, please check your student portal. Seniors are required to attend two Crosby Senior Academies (CSA), which are offered during the summer and throughout the school year. Topics range from preparing for the ACT and SAT to completing the FAFSA. Online registration is required through the Crosby Scholars Student Portal. Within a few days following an academy, seniors can check their Academy status through their Crosby Scholars Student Portal. Plan wisely in order to complete this requirement-- seniors are required to attend only two academies, so the Program does NOT offer a make-up session. To receive credit for attending an academy, scholars must: arrive on time, sign in, stay for the entire academy, and submit a confirmation of attendance at the end. Scholars who skip any of the steps to this process DO NOT receive academy credit. Seniors who register for an academy but do not attend and do not cancel their registration prior to the event will jeopardize their status in the Program. Read the special instructions listed in the Crosby Scholars Student Portal on accessing a webinar academy. 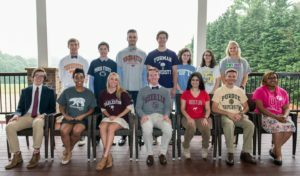 To fulfill the college fair/college visit requirement, Crosby Scholars must speak with four college admission reps about their respective schools. Students typically fulfill this requirement by attending one college fair and submitting a college fair form during their sophomore year, junior year, or senior year; however, juniors and seniors may fulfill this requirement by visiting four college campuses. Details are posted below and are outlined in the Crosby Scholars Student Portal. This requirement must be fulfilled by early October of your senior year. Submitting one college fair form or one college visit form is required to verify your presence. The most popular way to fulfill this requirement is to attend the local college fair in Winston-Salem at the beginning of October. Click here to view and print the college visit form for juniors and seniors. The key to the college admission process is to stay organized. Seniors should maintain a calendar and follow the timelines below. Seniors will receive a monthly reminder in their student portal to follow the timeline. Each month beginning in August, we will post a timeline to guide you through the month's activities. This guide will help you to stay organized. Celebrate National College Signing Day on May 1st – Tag us in your social media posts! The Last Dollar Grant application and instructions on how to complete the application will be posted in your Crosby Scholars Student Portal in the spring. Read these instructions before starting your LDG application. The LDG application deadline is May 15. The Crosby Scholars Last Dollar Grant is need-based financial aid. A scholar must apply for financial aid by submitting a FAFSA to be considered for a Last Dollar Grant. A scholar must demonstrate not only financial need but also remaining need after the school of choice has awarded aid. To determine the eligibility, the Crosby Scholars staff completes a need analysis form on each scholar individually. If the scholar does not have the three supporting documents by May 15, he/she must submit the application and then upload the supporting documents when they are received. Priority is given to those applications received prior to May 15. Scholars are notified of our decision by letter posted in their Crosby Scholars Student Portal beginning in July. An award is made payable to the institution and is sent directly to the institution to be credited to the scholar's account. The first half of the award is mailed after August 1 and is to be used for the fall semester. The second half of the award is mailed upon receipt of the scholar’s fall semester grades and is to be used for the spring semester. You are responsible for submitting your grades at the end of each semester. You do not have to submit an official college transcript. Submitting a copy of your grades printed from your college account is acceptable provided it includes your cumulative GPA. Students must apply for Last Dollar Grant funding within two years of high school graduation. The Last Dollar Grant policy states that scholars are eligible for funding consideration for up to four years of undergraduate studies within six years after high school graduation. The Senior Program publishes a monthly newsletter called destinationcollege2019. It is published monthly for Crosby Scholars in the Class of 2019 to keep them informed of activities, deadlines, and announcements. Each newsletter offers appropriate advice and assistance for a specific month. In addition to being posted on this website and in the Crosby Scholars Student Portal, it is posted on the Crosby Scholars Program bulletin boards at the high schools (except HBI schools and UNCSA) and at the Career Center. The link to the newsletter is e-mailed to seniors, parents, and Senior Advisors.